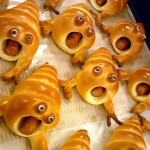 Once again Pinterest fails in the attribution department, so I’m not sure who’s responsible for these screaming pigs-in-blankets. They are, however, undeniably awesome and would be an easy hors de’oeuvre for a cocktail party. Since the sausages don’t appear to be baked into the dough, I’m betting that the cones were made using the same general method as for these crescent-roll “carrots:” Strips of dough are wrapped around a cream horn mold and then baked before filling. In this case, you’d want to add two bumps of dough for eyeballs (just stick them on with a little egg wash) and two small rolls of dough split at the end to make arms or fins or whatever those things are. Once baked, make your favorite recipe for cocktail franks (the ones in barbecue sauce are tasty) and insert one into each cone. Decorate the eyes with a little dab of powdered sugar thinned with milk, then add a pupil using either food coloring or a dot of melted chocolate (be careful not to use too much if you plan to re-warm before serving, lest it melt and run). You can even make them veggie by using baby carrots! Great! I’m going to put pepperoni with cheese under broiler then add them in the hole! I think I’ll also add guacamole in some too! The eyes will be those already ediable eyes! I’m thinking of skipping the arms and putting pipe cleaners formed into arms under them after they are cooked!! I’ll post a picture after I make them! I will use cream puff comes and probably use bread stick dough!!! What can we substitute for cream horn molds? Maybe a stainless knife handle or a regular sized raw carrot or a foil shape? Most of us don’t have cream horn molds these days ? You can buy ice cream cones and wrap them in tinfoil. You can also just make tinfoil cones but it would take a lot! I bought my cones online, 18 for about 12 bucks! It was worth it! Naomi just use some pilsbury biscuit or crescent roll dough. Easy peasy!